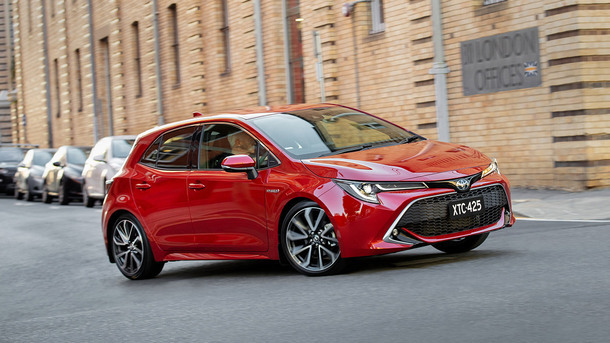 Toyota's Corolla is set to retain its mantle as Australia's best-selling passenger car with the imminent arrival of a new-generation hatch. The all-new Corolla hatch sits on an innovative platform that underpins bold exterior styling, an upscale interior, impressive driving dynamics and ride comfort, plus advanced technologies including class-leading safety. There are three grades and seven variants with hybrid technology now available at each level - Ascent Sport, SX and ZR, in a move expected to result in a substantial uptake in sales of Corolla hybrid. Toyota Australia's vice-president sales and marketing Sean Hanley said Corolla, more than any other car, had built the reputation of the Japanese automotive industry and the success of Toyota Motor Corporation. "This all-new Corolla hatch leapfrogs everything in the affordable small-car segment and sets the new benchmark," Mr Hanley said. 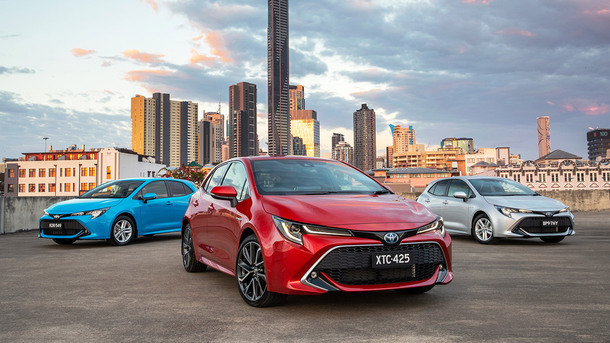 "Corolla has become the world's and Australia's best-selling passenger car - and the new Corolla hatch is even better through our commitment to produce more appealing and dynamic cars," he said. "Many of its ground-breaking technologies and class-leading features would normally be found in more expensive, prestige models." The new hatch's Toyota New Global Architecture (TNGA) platform guarantees a more rewarding driving experience with its lower centre of gravity, new multi-link rear suspension, 60 per cent more rigid body and improved weight balance. New powertrains significantly boost performance and driveability. A new 2.0-litre four-cylinder Toyota Dynamic Force petrol engine delivers 21 per cent more power (125kW) and 15 per cent more torque (200Nm) than its 1.8-litre predecessor while using less fuel*. A new Direct Shift continuously variable transmission offers a 10-speed sequential shift mode and mechanical launch gear - the first in the world for a passenger-car CVT - to promote brisk yet fuel-efficient off-the-line acceleration. Corolla's improved hybrid system is lighter and more compact due to advances in engine, electric motor and battery technologies - smaller, lighter and more efficient. The 1.8-litre Atkinson Cycle petrol engine shares a raft of technical features with the new 2.0-litre engine, including world-leading thermal efficiency of 40 per cent and a 13:1 compression ratio. Combined output is 90kW and fuel economy 4.2 litres/100km*. A more efficient, lighter and smaller multi-shaft transaxle has been tuned for greater low-down response and driveability. All CVT models feature three driving modes - ECO, Normal and Sport. A new six-speed intelligent manual transmission is available on Ascent Sport, providing rev-matching control for smoother and more responsive gear shifts. Across the range, driving characteristics also benefit from an active cornering assist system that applies brake force to the left or right driven wheels during high-speed cornering to supress understeer. All-new Corolla brings unprecedented levels of advanced safety technology to the small car class with the Toyota Safety System. Toyota anticipates a five-star ANCAP safety rating. A pre-collision safety system incorporates pedestrian detection+, including at night, as well as cyclist detection during the day, autonomous emergency braking and emergency brake assist. Active cruise control and lane departure alert with steering assist and sway warning are also standard. On CVT models, active cruise operates at all speeds while the lane departure technology is upgraded to lane trace assist, providing steering assistance to ensure the car stays centred in the lane. Corolla's windscreen-mounted camera recognises speed-limit signs - a first for a Toyota model in Australia. Other standard safety features include automatic high beam, reversing camera, hill-start assist, seven airbags and two rear ISOFIX child safety seat anchor points. SX and ZR also have blind-spot monitor. Corolla is longer, lower and wider than its predecessor - resulting in a more dynamic, prestigious and sophisticated road presence. The front profile is more vertical with a flatter bonnet flanked by bi-LED headlamps and integrated daytime running lights. At the rear, a lightweight composite hatchback sits between LED rear combination lamps housed in sleek units that emphasise the broad, solid stance of the car. 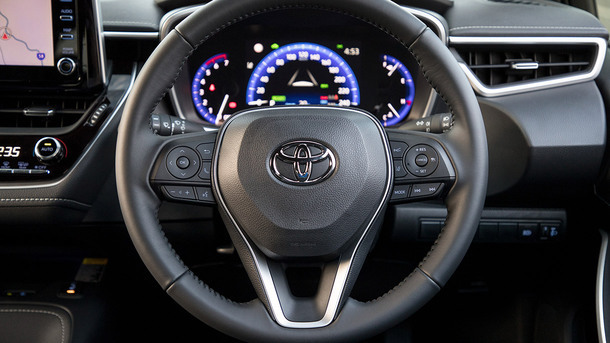 Corolla's all-new interior design significantly raises sensory quality while delivering an airy, open feel. Improved comfort and greater refinement are accentuated by the unity of colour, gloss and grain for the premium quality trims and surface finishes. Corolla is also more spacious, thanks to a longer wheelbase and increased body width. A thinner instrument panel contributes to better forward vision and there are new, more comfortable and supportive seats. The range starts with the 2.0-litre Ascent Sport that picks up all the new design, powertrain, safety and technology features. 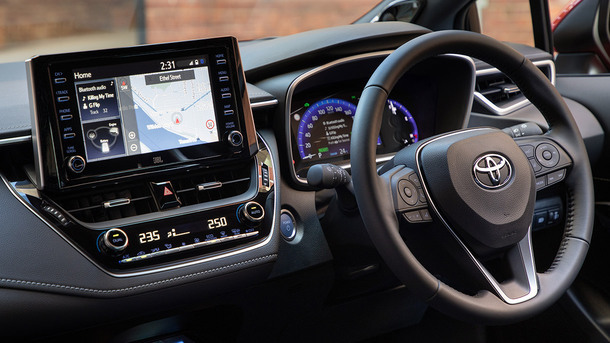 It is also equipped with an 8-inch touchscreen display, 4.2-inch multi-info display, air-conditioning, heated exterior mirrors, 16-inch alloy wheels and a six-speaker multimedia system with Toyota Link. 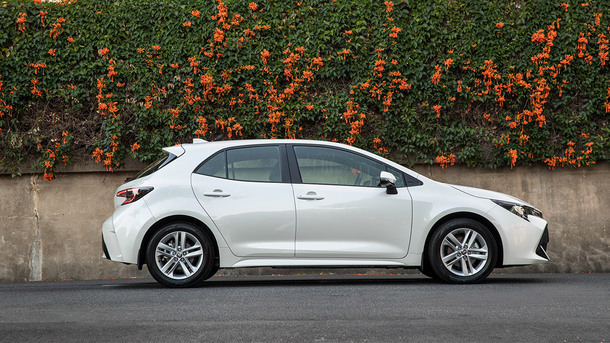 Fitted with Toyota's intelligent manual transmission, the price is from $22,870**. Satellite navigation is a $1,000 option on Ascent Sport and standard on other models. Buyers can opt for the new Direct Shift CVT for just $1,500. Across the range, hybrid variants are available for just $1,500** over the equivalent petrol models. Ascent Sport hybrid gains extra equipment over the petrol model with dual-zone climate control and keyless smart entry and start. Moving up to the SX, these two features are standard with petrol and hybrid variants having equivalent specification. SX also gains a wireless phone charger, DAB+ digital radio, front fog lamps, paddle shifters (CVT petrol), premium steering wheel and shift lever, privacy glass and a rear USB port. With CVT standard (petrol and hybrid), the step-up from Ascent Sport to SX is just $2,500**. At the top-of-the-range, the ZR is equipped with a large colour head-up display, 18-inch alloys, leather accented and suede interior with sports front seats, 8-speaker premium JBL sound system, 7-inch colour multi-information display, ambient illumination, electro-chromatic rear-view mirror and high-grade bi-LED headlamps. The premium over SX is just $3,500**. Every new Corolla hatch is covered by Toyota Service Advantage capped price servicing at $175 per service - now with 12-month/15,000km intervals^. * Achieved in test conditions. Actual fuel consumption and emissions may vary depending on driving conditions/style, vehicle condition and options/accessories fitted. Fuel consumption data provided for comparison purposes only. Source: ADR 81/02. ** Recommended retail price provided for general media release purposes only. Excludes dealer delivery, statutory charges and metallic paint. Optional extras at additional cost. + Pre-Collision Safety system with Pedestrian Detection is a driver assist feature only and not a substitute for safe driving practices. Driver remains responsible at all times for safe driving. Pedestrians may not be detected in certain conditions including low and harsh light, where partially obstructed from view, where clothing or movement obscures or effects body contours, persons under 1 metre or over 2 metres tall and where carrying or pushing large objects. ^ Maximum payable for standard scheduled logbook servicing (normal operating conditions) until first of 5 years or 75,000km (whichever occurs first) (up to the first 5 services). Excludes government and rental vehicles. Contact your Toyota dealer or go to toyota.com.au/advantage for other exclusions, eligibility and full details.